Canada to oversee Métis identity process? The Department of Indian & Northern Affairs Canada (INAC) seems poised to oversee the process of verifying Métis identity, at least according to a contract award notice on the government’s tendering service website, MERX. A branch of INAC, the Office of the Federal Interlocutor for Métis and Non-Status Indians has tentatively awarded a contract of between $50,000 to 100,000 for the “Development of a Verification Strategy for Métis Identification Systems” to the Ottawa-based Canadian Standards Association. But a spokesperson for the Métis National Council (MNC) says the move comes as a surprise. The MNC rep added that they were never told about the contract or that INAC was even planning to oversee Métis identity systems. The Council is the national voice for Métis governments in 5 provinces and territories. Those Métis governments are in charge of maintaining their own identification registries. I feel thoroughly sick at the idea that our membership/registration systems need to be ‘vetted’ by the colonial government. Very, very scary. Yea, what we need is definitely more colonialism/colonial interference. It is not up to the Canadian government to decide who is a Métis (or Anishnaabe, Haudenosaunee, etc), or to test the ‘validity’ of our systems of membership registration. Unfortunately, they have a long history of trying to define who we are, what Métis means, to control us through their sheer ignorance and submitting us to abject poverty, and to calculatedly disconnect us from other Indigenous peoples. We’d be naive to think it wouldn’t come up again. Not surprised that this would have to be under goverment control. The minute that we are talking about indigenous rights, the colonial occupier government has to take steps to limit the amount of people who may claim those rights. Powley funding has been issed to Metis organizations across Canada. In our Metis organization the registry is flawed and riddled with political interference. We welcome the overseers in the registry systems to ensure that the registry is identifying the true rights bearing Metis people under Section 35 of the Constitution. Registries should not be wielded as a political tool. I’m thinking that MNC needs a standardized process to ensure the quality and integrity of the membership process – and it’s paid for. I’m certainly okay with a standard process from an outside source that can ensure integrity and consistency for Metis identity. Personally, I think that the current Metis registries are insufficient and there’s been a lot of money pumped into Metis organizations for a registry so why not get an outside source like the Canadian Standards Association to make some recommendations? As a Metis person, I’m certainly not afraid of recommendations – I would welcome them. I don’t think that some of the commentators fully understand the nature of the contract since only part of it was put in the news article. They are not being asked to decide who is Metis or even tell me who I am as a Metis. They are simply being asked to standardize language. Perhaps this will be a benefit for a national registry (under Metis control) that so many Metis who are left out of the current Metis political process can identify under it. THE CURRENT SYSTEM DOES NOT WORK AND METIS ORGANIZATIONS HAVE BEEN GIVEN THOUSANDS UPON THOUSANDS OF DOLLARS TO MAKE IT WORK TO NO AVAIL. So, if this is a new crack at an old issue, I’m all for it. No matter what, I am and will always be Metis no matter what. Am I reading this correct..?? Is INAC going to “develop a common standardized approach for assessing the quality and integrity of membership systems employed by the five affiliate organizations…”? It does not mention who these five affiliate organizations are but let me venture a guess…Metis Nation of Ontario, Manitoba Metis Federation, Saskatchewan Metis Nation, Alberta Metis Nation and the British Columbia Metis Nation…! Am I Correct thus far? Are not these five affiliates associated with the Metis National Council Inc. ? Here is a little History Lesson for the Metis National Council and their Affiliates. 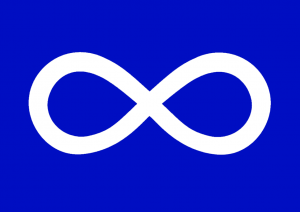 The Metis Nation of Canada did not begin and end in the Western Provinces of Manitoba, Saskatchewan and Alberta. The Metis People of Canada began on the East Coast of Canada where European Men fist came into contact with the Indigenous First Nations and Inuit People. The Metis National Council and their five affiliates discriminate against Metis People from else where in Canada. First Nations Membership and/or Inuit Membership…Good Luck with that one…!!!! Consider if you will…..One National Organization that is responsible for the Registration of all Metis People of Canada, not just the five aforementioned affiliates of the Metis National Council Inc.
That Organization would be the “Metis Nation of Canada – Nation Metis du Canada”. The Metis Nation of Canada was incorporated January 21, 2009 with one of its objects of incorporation being to maintain a National Registry with the Canadian Government. Federal File #: 450890-4. I beg to differ Bruce Fequet, the registry systems were established to find all the descendants of “scrip” systems, which began in Manitoba to extinguish the rights of Halfbreeds. The “scrip” systems were flawed and was a tool for westward railroad expansion under John A. Macdonald. Most of the “scrip” ended up in the hands of major banks and speculators. The Metis people did not lose their rights due to this process. As the powley case evolved which recognized that the Metis Nation collective had continual rights on the land base, powley funding was alloted to verify the Metis people with genealogical connections to the scrip recipients. I do agree that the Metis registry should be a National registry, since Metis people are a National entity and a mobile Nation. Our family genealogy extends from Manitoba in the early 1800’s into Montana, shipped into Alberta by the Canadian/United states government while on the other side of the newly formed border. I have found records in 1894 that ties our family into BC as well. In the 1700’s orkney men arrived in York factory on the shores of the Hudson’s bay, and mixed with the local aboriginal people. Succession after succession of families they intermarried into their own communities maintaining the culture. Most of our families headed westward after the rebellion, and earlier guides and scouts for the NWMP, palliser, red grave party expeditions. Gotta laugh no …white-people get to decide who are and who are not a member of a particular community(who gave the settler gov that right?). Can’t wipe em out,well then , legislate em out of existence. Because the settler government will ensure & protect your -Metis- Section 35 rights… just a “well” as they have protect First Nations rights,right ? well i guess since 1982 went the Federal grovernment gave the same rights to Métis as indians and inuits people,the groverment saw that they had made a great mistake because they don’t know their history,(The Metis People of Canada began on the East Coast of Canada where European Men fist came into contact with the Indigenous First Nations and Inuit People.) the powley case was a way out for them they tought that they were giving rights to Métis out west but they seen the east coming alive and the Métis from the East as a enemy,so this a great way to put rules to prevent the Eastern Métis to enter the money pot,Take a good look at who is runing the show out west for Métis English speaking leaders with french names. Jennifer you have to look at this that the colonial government is paying the note for Métis people also for First Nation with our tax money,if you want them out of there who will pay all the money for our great Métis leaders,money for meetings,conferances,big Hotels big fat meals,a few envelopes $$$$$$ now and then,plane fare ect…….i seen meetings that cost close to 300,000$ maybe more rooms at the Marriots Hotels,cost of rooms per night around 450.00$,the West walked out at the meeting because they were anry at the East,this procedure lasted all weekend in Ottawa,a big lost of our tax money and agian all to the greedy and nothing to the needy. Food for Thought: Why should the Metis be able to create, maintain and regulate their own membership/citizenship when the Indigenous Peoples in Canada (to whom they owe any ‘distinct’ status or rights) are still being denied this? What makes them more of a priority? Why not work with Indigenous Nations in a united struggle to regain control over our citizenship together? If they are not willing or interested to assist us with our struggle then they are another layer of the problem expecting superior status and treatment which they are not entitled to before or above the original peoples/Nations of this land! Potentially, without a process for accountability, the Metis population could skyrise with little investigation or legitimacy to the historical roots/entitlements of their citizens. You are mistaken to portray the LEGALLY OWED MONIES TO INDIGENOUS PEOPLES IN as “tax dollars’!!! Do you enjoy your citizenship, access to adequate or high standard of living in Canada? Do you enjoy being able to freely roam through our territories? I am sick and tired of hearing this taxpayers whine…if you don’t like paying into the regime that regulates YOUR citizenship then move somewhere else in the world but make sure you do your homework on whether or not the state involved is subject to international laws and obligations pertaining to legally owed duties ($, lands, sharing of resources) to indigenous nations. Do you think the land and wealth you enjoy on our lands comes for free??? I agree that current corrupt ‘leaders’ (ha!) are stealing our dollars (not yours) and that the people need to stand up and say ‘no more’. But we do not owe settlers anything. Your comfy lifestyles are because of the taking of our lands, resources and this is NOT FOR FREE or it’s Theft! Do you think if your rationale would stand up legally that the state would not have already absolved itself of paying any further monies to our Nations? They can’t escape it and neither can you! This is between the state and our Nations….period. Take the taxpayer argument to the state u may find the recourse you feel you are owed for having to pay into their regime…..
Ok it’s not hard to understand the white government must divide us to make sure that they control us Media,you see they give money to certain leaders so these leaders will be on the government side not the Métis people,well here is the answer to your question all these leaders will never claim land and that is what the government is afaid of LAND CLAIMS,the government have been doing this with First Nations why would they not do the same to us,just check with all the groups out west they call the land Métis homeland or Rupert’s land but who is the owners of this land not the Métis people that is for sure. Hello CCMC Metis Citizen well here in the Eastern part of Canada the registry is flawed for sure because there are so many Métis groupes since 1982 they charge and amount of money to become a member of these groups with a whole bunch of promises,so members jump from one group to another some Métis I know have up to 5 cards so they are registered 5 times as a Métis person,so thats why i have none of these cards i know who i am as a Métis i really don’t need these money hungry greedy persons asking me money for a false membership with false promises.you see the government loves this seeing the greed of certain Métis it’s like the gold rush KLONDIKE wake up people. end effective January 23, 2011.
keep any of my family history on file, hard copy or electronic copy. meetings with them as did France Picotte at the Oshawa Metis local. many Metis locals unless they smarten up considerably. Nationally! Keep in touch,take care. Bushman Bob. Subject: Canada to oversee Métis identity process? contract award notice on the government’s tendering service website, MERX . Identification Systems ” to Ottawa-based Canadian Standards Association . contract or that INAC was even planning to oversee Métis identity systems. Subject: Re: Canada to oversee Métis identity process? people want – to become Indian-act Metis!! NO I DON`T THINK SO!! interests recognized by all parties in Federal and Provincial Governments. New immigrants have a process to follow to become Canadian Citizens. exactly who the Metis Citizens are in a proper way. Aboriginal People especially in Canada! their National Metis Nation of Canada Card which we will provide. As I said before , Happy New Year !Take care, Bushman Bob. Cuthbert Grant was a native of Montreal and had many relatives there and the same first Metis leader who brought many Metis families from Pembina and Montana to settle in Manitoba,and the same family that owned and ran the Northwest company,next you will be tring to say Cuthbert or and Grants are not Metis! well think again. They gave out scrip to just about anyone back then,many of the 400 british soldiers that came to arrest Riel where given scrip and they where not Metis and does not make them Metis,the only scrip that means anything was the Halfbreed scrip what is very different then land scrip. well after reading a lot of what is said in these posts i am even more for the Metis Nation Of Canada to get going full speed a head. For all who say the Powely case was just for the west and needs script to be a metis needs to go back and reread the the case file it reads that a person must self identifiy, must prove ancestral connection no date or year specific, must be accepted by the modern comuntiy. PERIOD …….. from there the rules where then made up by organizations stating one must have script to the home land wich is western north central america……. which in my opionion is bull being metis has nothing to do with script or no script it has to do with ancestry blood line…. and with these rule they have in place Riel and doumont would not be metis to there registry but yet they base there history and funding requirments based on these 2 very well known Metis Heros And yes in my eyes they are Heros….. So I metis Nation Of Canada and INAC can work together to get a national regisrty together that works Why Not this would at least get ride of the Discrimination. Change can only happen if we as a Metis Nation Which i Mean all Metis of Canada and the US Stand together for the people and not a way of gread. we can make that change happen and the power that the people have know would get smaller and smaller. It is a sad day in my eyes to see that the M N C discriminates against Metis people or as a smart man told me the new metis generation. MNC ways is killing off the metis people as a whole they are taking the numbers and widdling them to nothing why because power gread what i do nto under stand. because there has all ways been a answer to every problem. and every no can be changed into a yes if you ask the right questions. A Metis is a blood descendant of the original Indigenous families of Turtle Island (also known as North and South America ) and a blood descendant of the original allied families. Our families are the indigenous descendants of the chief and head families engaged with trading from other nations including all the indigenous nations of North and South America . Following the introduction of European trade goods and the offers of peaceful alliances based on traditional trading practices, trade based marriages were arranged that facilitated the peaceful trading in European goods. Competition between indigenous nations over trade and territorial boundaries sped up the number of nations allying themselves through blood based marriages with the new suppliers of trade goods. Like the gypsies in Europe these families held their own hierarchy and family traditions based on indigenous models of living. The new offspring emerged united as allies to the Indigenous Families under the identifying names such as Bois Brule, Coureur de Bois, Otipemisiwak, The Free people, Metis, Voyageurs, Norwesters, Great Plains Michif, Michif speakers, Louisianna Metis, Acadians, Cajuns, Melungeons, Creoles, the flower bead people, half breeds, breeds and others. We lived in our free and allied territories from one coast to the other. 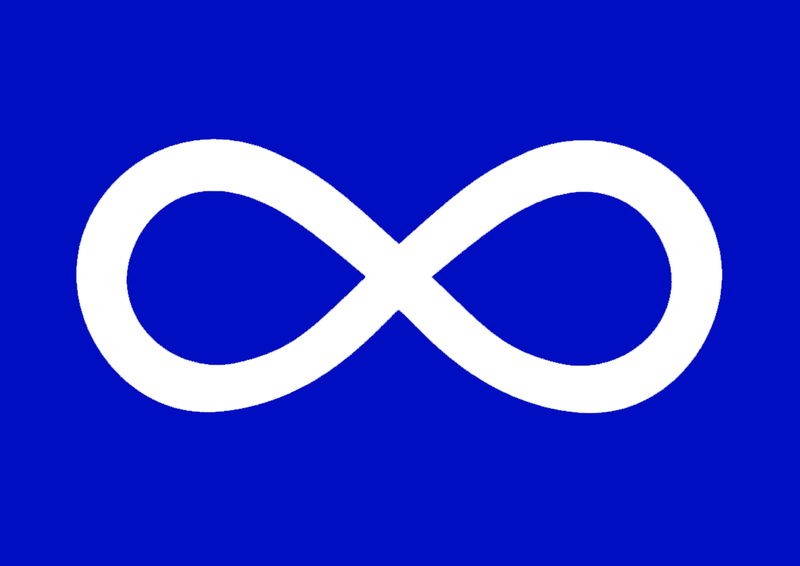 Following the European feudal incursions and challenges over legal land title our families united as the Metis Nation with a blue flag and white infinity symbol. All who desire to identify as a member of the Metis Nation may do so from direct Metis descent or from allied family descent. Allied families include the Indigenous Nations – referred to alternately as North American Indians, South American Indians, Native Americans, Natives, Aboriginals etc. and families related by kinship to the original allied families. The original allied families are those families not originally from the region of Turtle Island (North and South America ) who within the last two or more millennia joined their families as allies with the families of the Sovereign Indigenous Nations and who identify as being of Metis descent. Written in 2008 as head of the Metis definition committee for the Candain Metis Council. Let’s not forget, the NMC does not represent us all and with the narrow way it defined who is a Metis, It comes as no surprise the government has stepped in. We “eastern” Metis could have been your allies in this but you have decided to exclude us so now you have a lot less voices. Don’t blame the colonial government, blame yourselves. Sorry I am late to this discussion. I think the difference here is that the MNC didn’t request the independent evaluation. From what has come out in the media it seems that this is something the government has taken upon itself to initiate (hence Chartrand’s later response). Had CSA been contracted BY MNC, that’s a whole different ballgame, but that does not appear to be the case here and if it comes at the initiative of the government who desires to verify the legitimacy of the systems and of the people it gives money to, then it is overreaching and heads into colonialism territory. It has nothing to do with being afraid of them. It’s standing up for the sovereignty and freedom of the Free People. People also misunderstand the role of MNC. It is an advocacy body, not an identity registration body. Having a card with any of MNC’s affiliates is not what makes a person Métis or not Métis. Métis is about family, who you come from, and community. You don’t just become Métis because they give you a card. The card just means you are a part of their political system, like joining the NDP, and you anticipate they will advocate on your behalf. So it is a moot point about identity (even by the organizations themselves), except when read in concert with the history of Canada’s attempts at defining Indigenous identities. I think it’s reasonable to be concerned with this outside initiative. I think we need a standard. As there are more than a few Bogus metis groups, orgs out there. Many with very different or self serving agendas. This really is a plague. It’s genesis is the United Nations, and they have found a way not to conquer all people who self identify as Indian but to marginalize and suppress the whole of Indian livelihood. What this has resulted in, are infiltrated and corrupted self-governing Indian Affairs councils, where a few big headed ego maniacs and their greed are now dictating who is and is not Indian. They were told they could govern themselves. What they didn’t realize is that government was not necessary. Now, there are families who are as fully native as you can get in todays modern times, living all over Canada, who have women in their families that are being disgraced if they do not marry what is called a “status Indian”. That is, their lineage is no longer being honored within their own families as being native unless the husband or wife of that family has “papers”. The end result of this segregation will be that you are not native by law unless you can be tracked. That is Nazi Germany. And so here is yet another of many, many Indian Affairs Commissions ripping apart and eating its own where you can clearly see money and greed over human beings. I am against these programs, implemented for the purpose of segregation and marginalization if not intentional eugenics (see Vermont Eugenics Survey). I am against these programs which are called “state recognition” and “status Indianship”. Same old ploys . Weaken the numbers . Delay tactics . Deny as many as possible . Crown will decide who is and who isn’t . Well we are dealing with an untrustworthy self serving institution ( government ) , so it suspicions all organizations are same as its self and can’t be trusted to qualify members . This ploy should stall things and probably result in more court proceedings another 5 – 15 years . By then a considerable number of the original applicants should be deceased and their offspring discouraged enough to accept a government version of rights . Some forms of genocide are subtle and take a long time when not done under the guise of war but are just as effective .